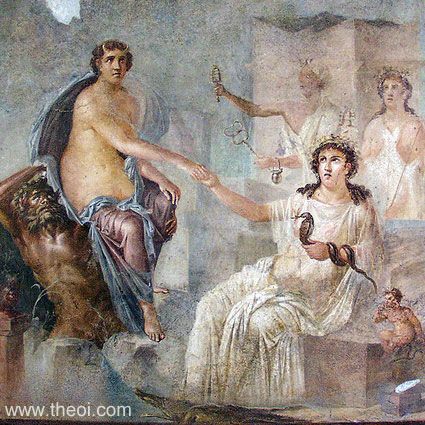 Zeus' paramour Io is received by the goddess Isis in Egypt. The cow-horned maiden is carried upon the shoulder of the river-god Nile (Greek Neilos) and greets Isis with a touch of the hand. The goddess is clothed in a white, linen robe and holds an asp in her hand. The boy Harpocrates stands to her right with a finger pressed to his lips. The unidentified man in the background, perhaps a generic priest of Isis, holds a rattle (sistrum) and herald's wand (caduceus).